If you follow the farm on facebook then you already know, Matthew and I got married last month! We're still having a big farm wedding this Summer so this was something quick and fun to make our marriage official before our son comes in April. Instead of doing the courthouse we made the quick trip down to Portland to get married at Voodoo Doughnuts! That's right, they do legal weddings there. The night before the wedding was kind of a disaster due to a sick toddler vomiting all over the very nice hotel room my mom surprised us with. That poor room service man, I'm sure he didn't imagine he would be making two trips to a room in the middle of the night with clean linens. Matthew, having worked in hospitality before becoming a nurse was very apologetic and bundled everything up nice and tidy for him. I was busy in the bathroom washing my daughter's vomit off of my own body. Who said the romance ends when you have kids? Thankfully, morning came and all was well! My mother drove up from Coos Bay, Oregon; my brother and niece surprised us by flying in from Austin and Matthew's mom and stepfather came down from Olympia, Washington (where our farm is). We also had a group of friends drive down just to stand in the shop with us while we got married. Seriously, it was an amazing day filled with so much love and giggles. We really are the luckiest people. Not just because we found each other, but, because our families and friends are so supportive of us and our beautiful life. Our doughnut box runneth over. This is walking across the street to the doughnut shop. That's my mom, my niece, Giz (being held by my brother), my incredibly good looking groom, and me! My mother, who is eternally talented, made Giz this dress the week before when she got a wild hair to make something fabulous! It turned out so amazing. I just love this photo so much...my mom and I made my bouquet over Christmas break out of vintage brooches and her old 80s earrings collection! 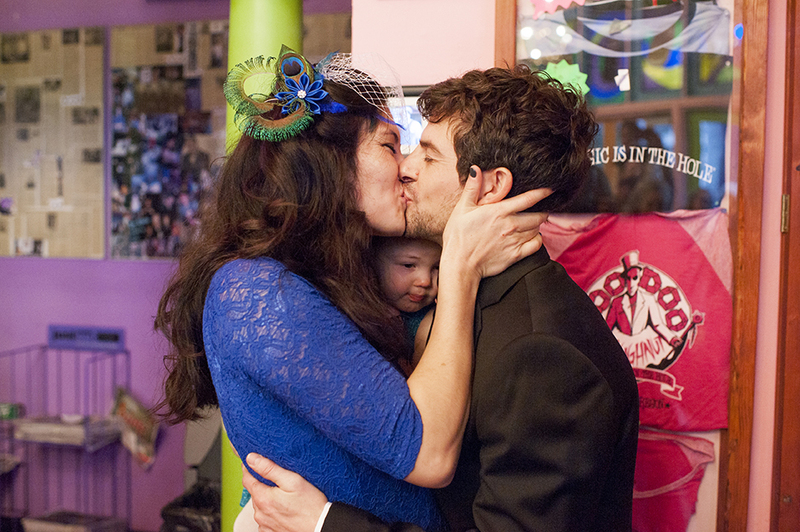 The best part about this photo is the fact that the three people in the back, who are really really happy and taking a video, are not actually anyone we know :) When you get married at VooDoo Doughnuts they stop selling doughnuts, but they don't shut the shop down. So the store was packed with lots of surprise guests to our wedding! My mom with her two kids and her two granddaughters. My niece wore her doughnut shirt! Here's a better shot of the bouquet and the dress. It weighs about 100 pounds. Matthew's mom and step dad! Those are doughnut sprinkles in his hair! And of course! The doughnuts!!! I sent VooDoo Doughnuts this picture of us from our vacation to Joshua Tree National Park this Fall (I was 14 weeks pregnant with our son here!) and they turned us into doughnuts! Nailed it! Photos are important to me, and even though our ceremony was only 10 minutes I knew I wanted to live in the moment and not worry about taking photos myself. So I hired a professional photographer for our wedding. Aspin Photography in Olympia, Washington shot this photo and will also photograph our wedding in August. She doesn't normally do weddings but as a lover of The Farmstead she was willing to make an exception :) If you are in the market for a birth photographer or a lifestyle photographer Brandi is your girl. She has a knack for capturing the best of people without you even knowing. Looking back on these pictures from our first wedding I'm so happy I made photos a priority. Because I knew I would have an infant and a toddler at our wedding in August I budgeted to hire a wedding planner. It was, apart from my professional photos, the best idea I ever had. Bright & Co. Events is an innovative up and coming event planning businesses in Seattle and Kiara (the owner and founder) is truly amazing. I have sent her so many ridiculous ideas and she just rolls with every single one, adding to them, tweaking them, and essentially turning them into usable thoughts. If you like the doughnut wedding just wait until you see the real wedding!